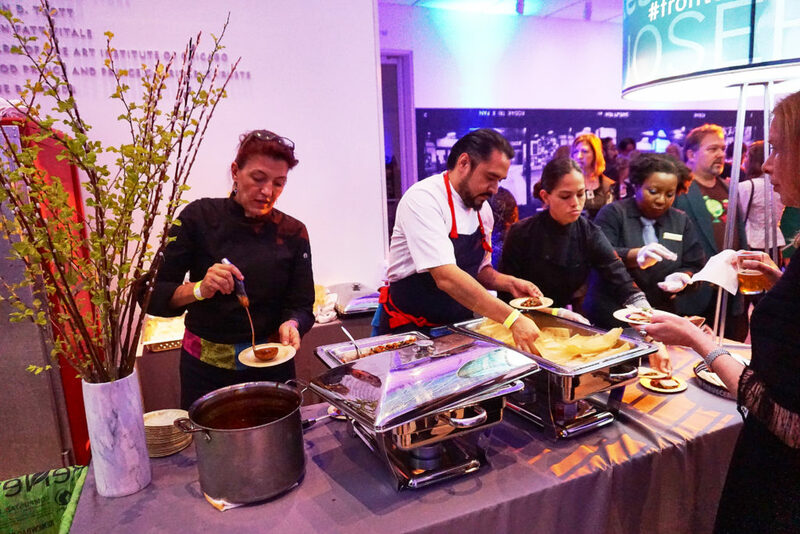 The people who attended the Frontera 30th Anniversary Celebration on Sunday (April 30) — to help accelerate the Good Food movement — hopefully will always remember the evening they spent in what we called the Culinary All-Star Food Court. 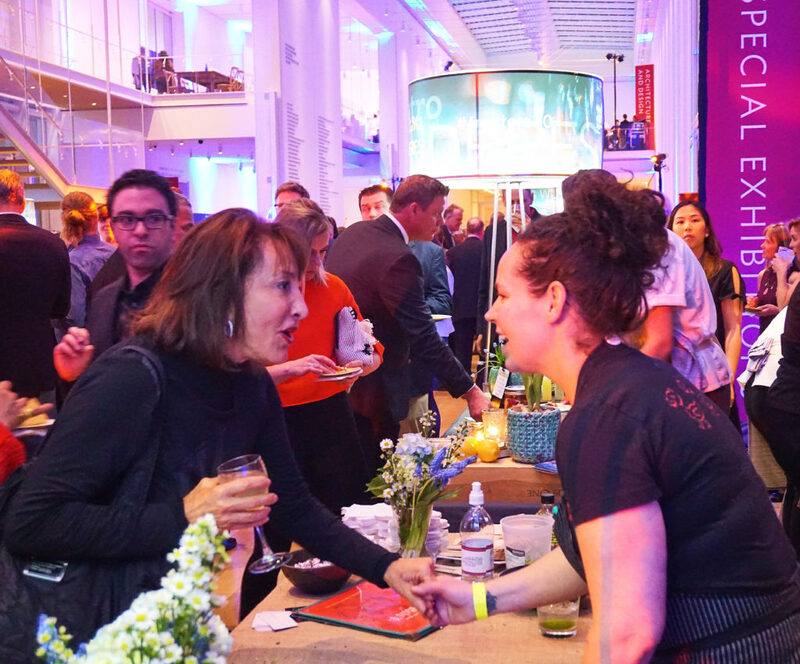 Sixteen world-class chefs took time out of their very busy schedules, the night before the annual James Beard Foundation Awards were held here in Chicago, to provide the guests with incredible savory and sweet dining experiences. 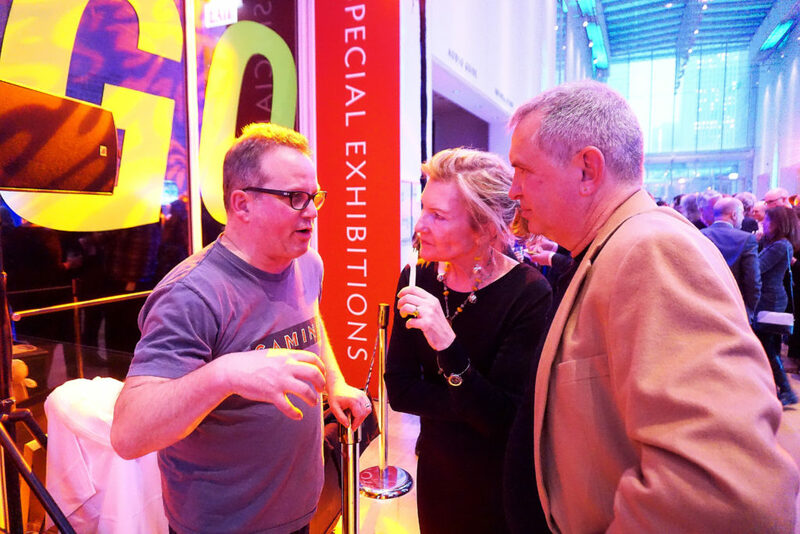 Two other legends, Paul Kahan of Chicago and Nora Pouillon of Washington, D.C., participated in the Good Food Forum panel discussion that proceeded the Good Food party for the ages. 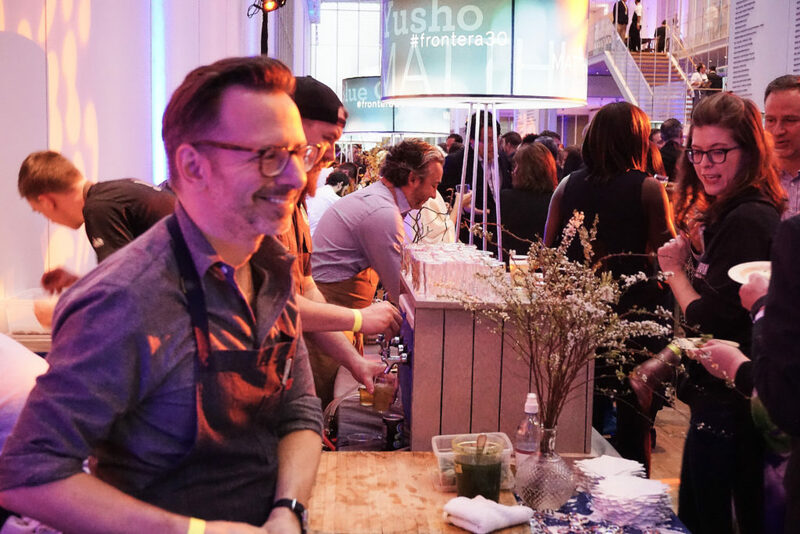 FamilyFarmed and our friends at Chef Rick Bayless‘ Frontera Farmer Foundation — the co-producers and co-beneficiaries of this fundraising event — are grateful beyond words to these chefs. 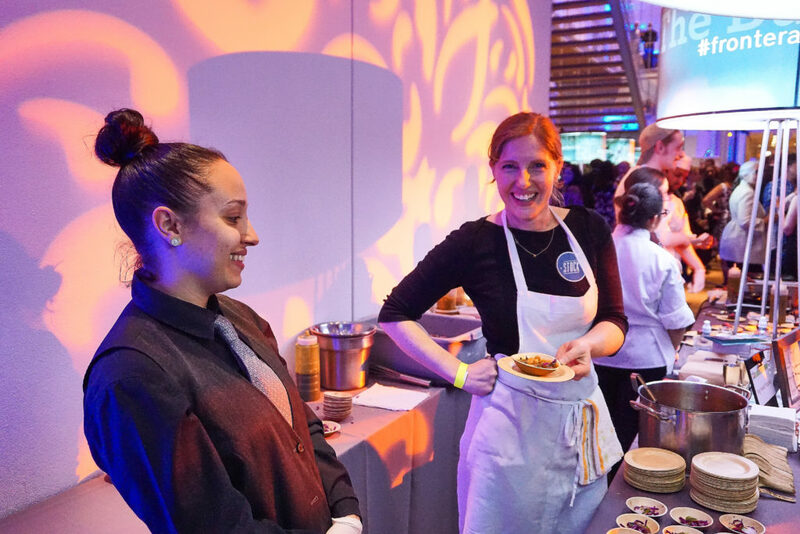 The money raised by this event will have a big impact in helping FamilyFarmed and Frontera Farmer Foundation build a better food system, by working with farm and food entrepreneurs to help them succeed and scale up. Good Food on Every Table also would like to thank the chefs who shared their time for interviews about their careers, the decisions they made that led to their success, their dedication to local sourcing and small farmers, the importance of mentoring and collaboration in the culinary world, and the need to provide food education to the nation’s youngest eaters. So as our thank you note, we present a photo essay of all of the participating chefs (in alphabetical order, with one important exception). Where relevant, links to the chef profile series are provided. Johnny Anderes is chef at The Kitchen, the Chicago location for the Colorado-based restaurant group. The company also established the nonprofit Kitchen Community, which has built and maintained more than 200 school gardens. Click here for Good Food on Every Table profile. Brent Balika is executive chef at Chicago’s Waldorf Astoria hotel, where he is developing the soon-to-open Margeaux Brasserie and Margeaux Patisserie for the Mina restaurant group. Click here for Good Food on Every Table profile. Abra Berens (right) is executive chef at Stock Café at Local Foods in Chicago. She is a chef activist and farmer who advocates innovation ways to combat food waste and creates creative dishes from seasonal ingredients. Click here for Good Food on Every Table profile. Abe Conlon and business partner Adrienne Lo are co-owners of Fat Rice, which introduced Chicago and most of the country to the unique cuisine of the Chinese island of Macao (which for hundreds of years was a colony of Portugal). 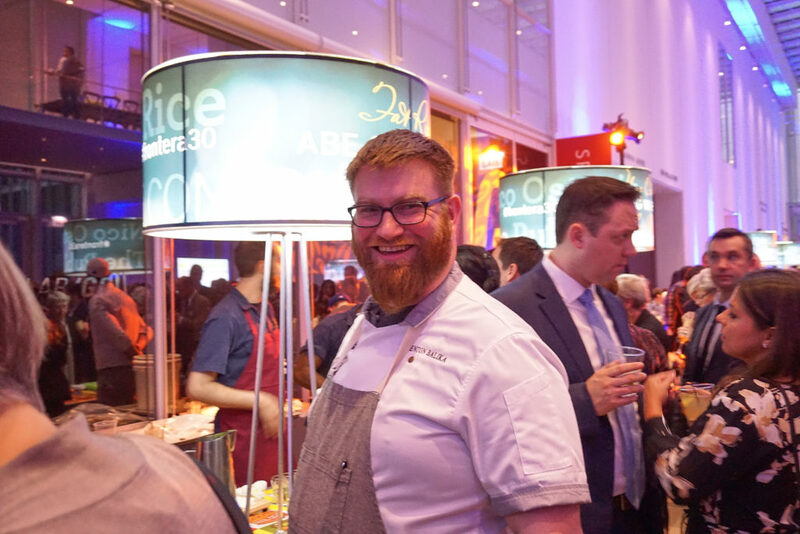 Abe was a nominee for James Beard Best Chef: Great Lakes this year. Click here for Good Food on Every Table profile. 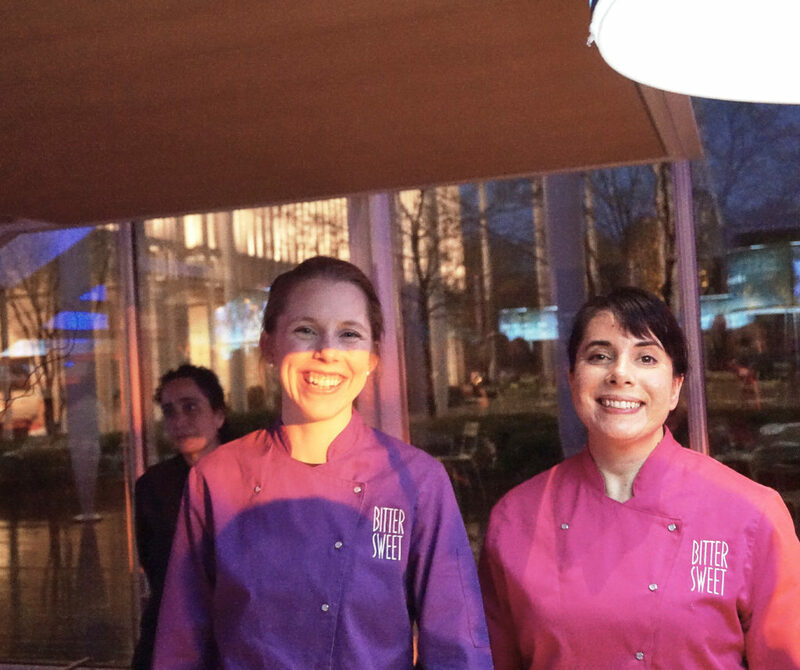 Mindy Gohr (left) is executive chef of Chicago’s Bittersweet Pastry Shop and Café, seen here at Frontera 30 with co-owner/business partner Esther Griego. Click here for Good Food on Every Table profile. Rising stars Cosmo Goss of The Publican (left) and Erling Wu-Bower of Nico Osteria each serves as executive chef for restaurants in Chicago’s One Off Hospitality Group founded by Chef Paul Kahan. They are in the process of developing their own restaurant in partnership with One Off. Erling also was nominated for Best Chef: Great Lakes. Click here for Good Food on Every Table profile. 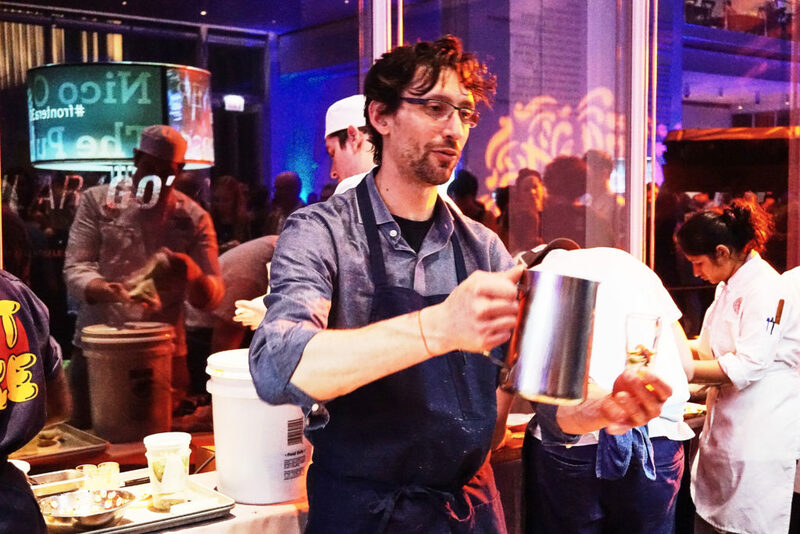 Jason Hammel, a leading advocate of local food sourcing, is the force behind the hugely successful Lula Cafe in Chicago’s Logan Square neighborhood, and is developing the soon-to-open Marisol restaurant for the city’s Museum of Contemporary Art. 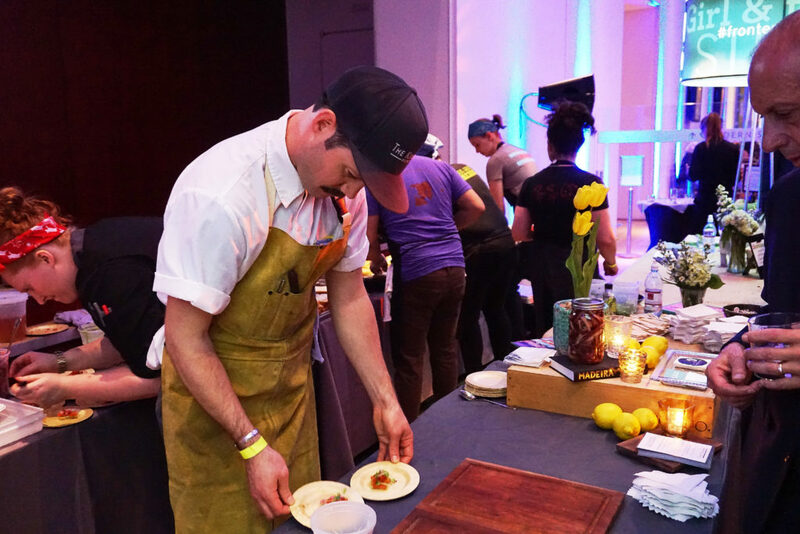 Jason is a co-founder of Pilot Light, a chef-driven program that works with Chicago Public Schools to integrate food education into students’ curriculum. Click here for Good Food on Every Table profile. We were fortunate to capture this moment between two generations of leadership for women in the culinary world. 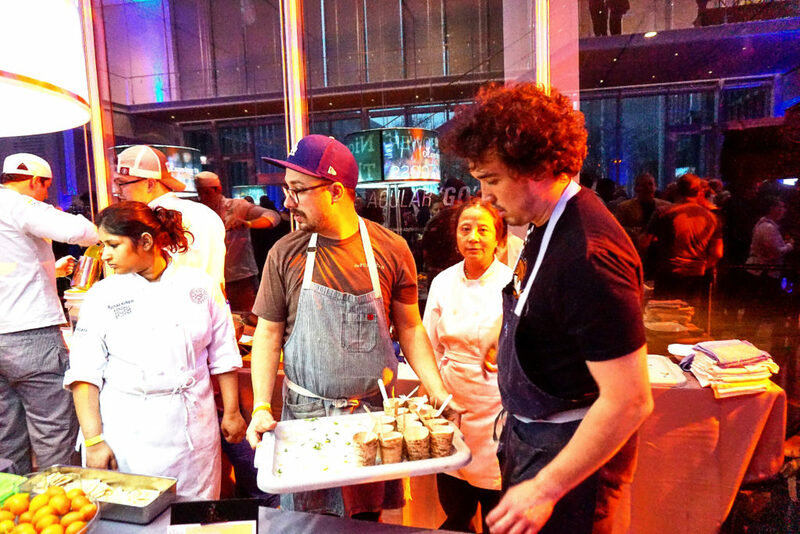 Stephanie Izard (right) was already established as a rising star chef in 2010 when she opened the Girl & The Goat, the West Loop restaurant that would earn her the 2013 James Beard Award for Best Chef: Great Lakes; she has since opened the Little Goat Diner and Bakery and the Chinese-themed Duck Duck Goat in the same neighborhood. Nora Pouillon’s nearly 40 years at Washington, D.C.’s Restaurant Nora — the nation’s first certified organic restaurant — earned her this year’s James Beard Foundation Lifetime Achievement Award. Click here for Stephanie’s Good Food on Every Table profile. Paul Kahan Paul Kahan (left) launched the One Off Hospitality Group 20 years ago when he opened Blackbird, which helped ignite the transition of Chicago’s West Loop — a longtime meatpacking district — into the city’s Restaurant Row. With business partners Donnie Madia and Terry Alexander, he has expanded the group to 10 restaurants, while also co-founding the Pilot Light food education program. Click here for Good Food on Every Table profile. 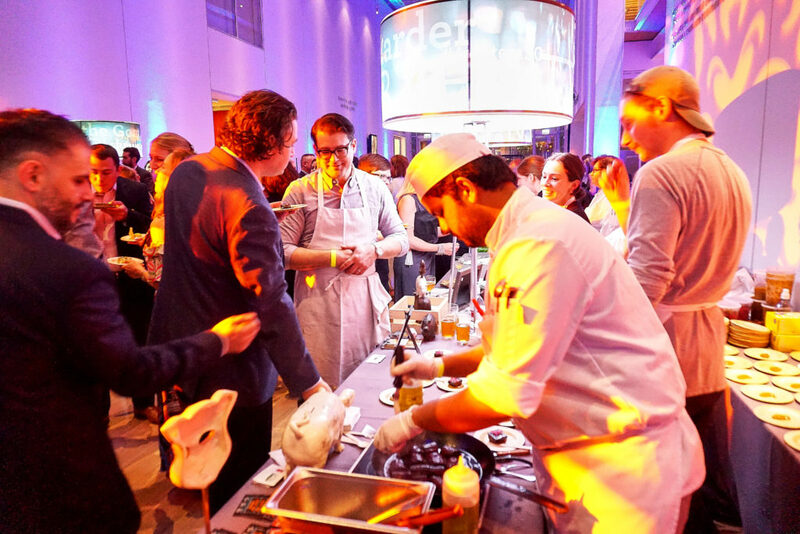 Rob Levitt (left, in apron) has made a major impact on Chicago’s food culture since 2011 when he opened The Butcher & Larder shop, which specializes in locally and sustainably produced meats. The shop since 2015 has been located in the Local Foods retail store in the Bucktown neighborhood. Rob was a highly regarded chef and restaurateur before he focused on the butcher trade. Click here for Good Food on Every Table profile. 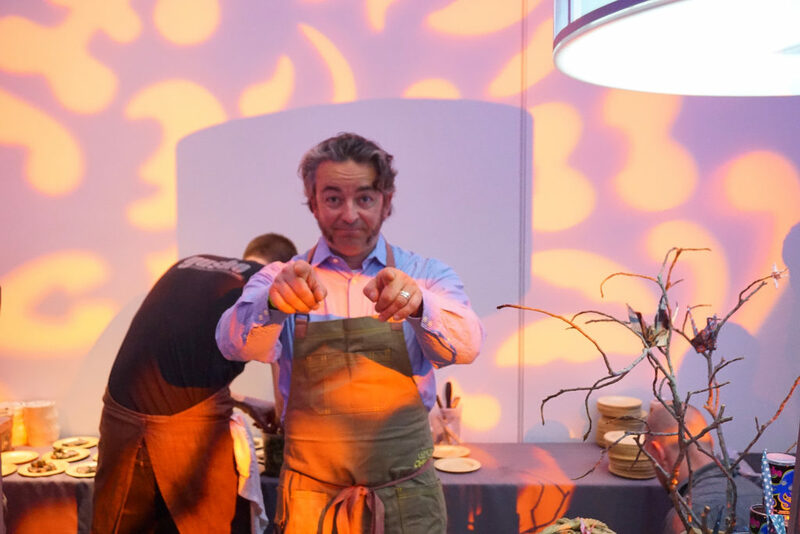 Matthias Merges created the fast-growing Folkart Restaurant Management group in 2010 after a long tenure as executive chef at Chicago’s legendary Charlie Trotter’s. Beginning with Yusho in the Logan Square neighborhood, he has expanded to Yusho Hyde Park, Billy Sunday, A10 and Old Irving Brewing Company. Matthias is a co-founder of the Pilot Light program and an advocate for local (and hyperlocal) growers. Click here and here for Good Food on Every Table profiles. 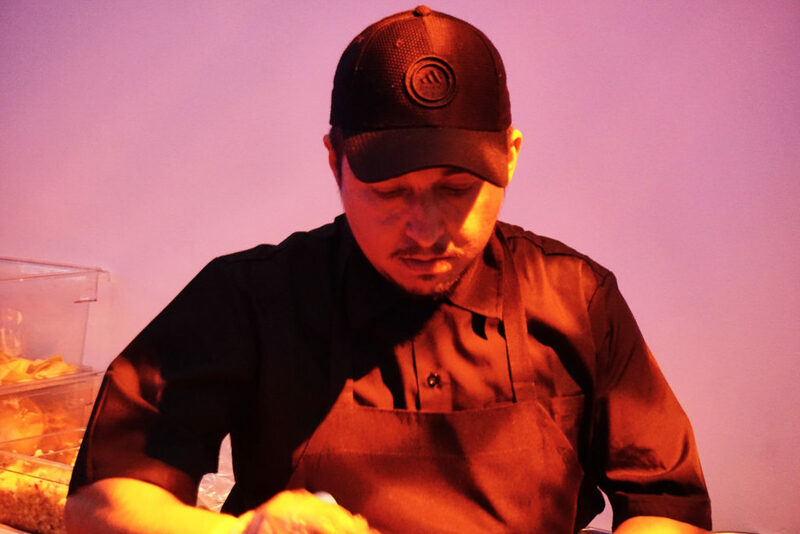 Long before he opened Ixcateco Grill in a northwest Chicago neighborhood in 2015, Anselmo Ramirez was a teenaged Mexican immigrant who saw Rick Bayless’ Mexico One Plate at a Time TV show and determined that he would work for the chef someday. Starting as a dishwasher at Frontera Grill at age 17, Anselmo worked his way up the kitchen ranks at Frontera and Topolobampo over 13 years. He now serves his own take on regional Mexican cuisine, and his cozy and colorful restaurant is regularly packed. Click here for Good Food on Every Table profile. Josefina Santacruz (left) is a star chef in Mexico City’s Restaurante Sesame. She traveled to Chicago to help her friends Rick and Deann Bayless celebrate the 30th anniversary of the opening of their landmark Frontera Grill. Mindy Segal Pastry chef extraordinaire Mindy Segal began her independent restaurant career with Mindy’s HotChocolate in the Bucktown neighborhood, and has recently expanded to HotChocolate Bakery at downtown’s Revival Food Hall and Mindy’s Edibles, which creates tasty and carefully dosed treats for authorized medical marijuana users. 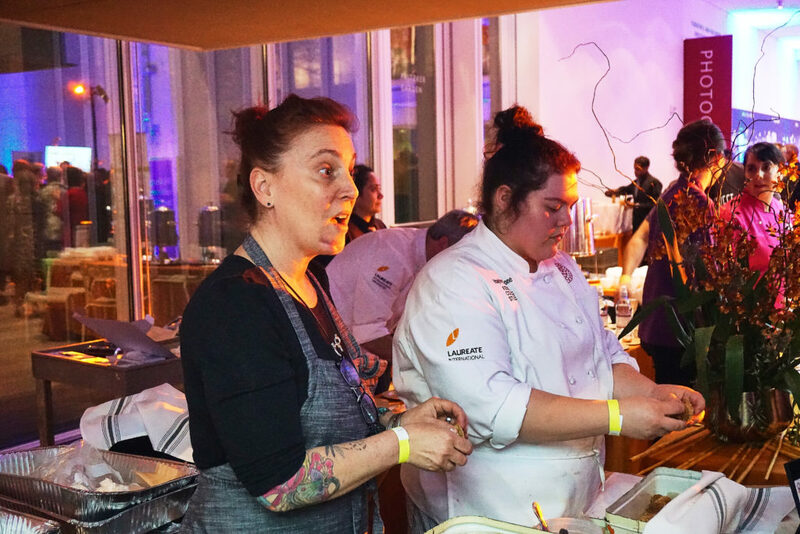 She previously rose through the restaurant ranks under world-class mentors such as pastry chef Judy Contino (who went on to own Bittersweet Pastry Shop and mentor Frontera 30 chef Mindy Gohr), Erwin Dreschler, Charlie Trotter and Michael Kornick. Click here for Good Food on Every Table profile. Ming Tsai is not the only chef who has succeeded with fine-dining Chinese cuisine, but he may be the only one with a mechanical engineering degree from Yale University. 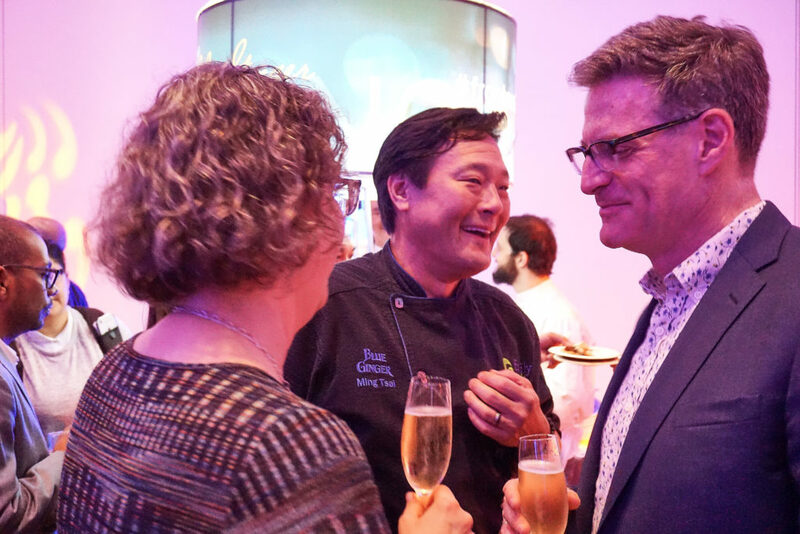 The chef-owner of Blue Ginger in Wellesley, Massachusetts and Blue Dragon in Boston, Ming (like Rick Bayless) is a celebrated TV chef: His Simply Ming has run on public television for 14 years. Click here for Good Food on Every Table profile. 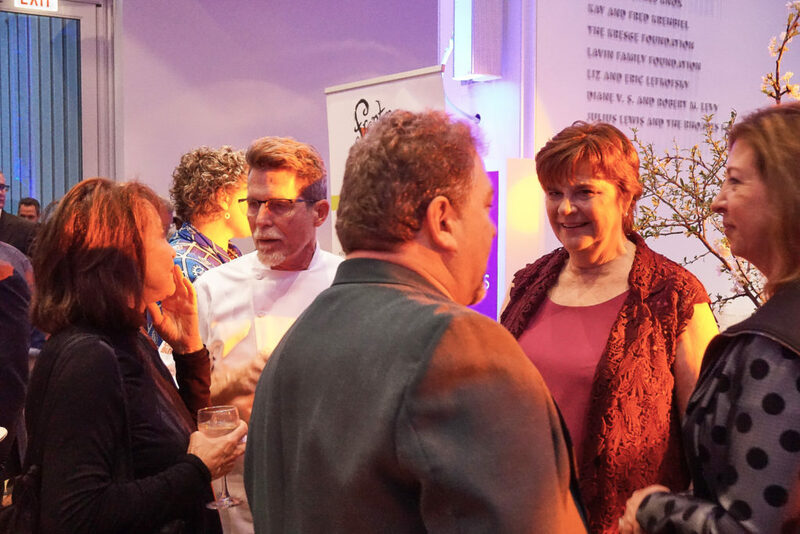 Rick and Deann Bayless mingled with the guests at the Frontera 30th Anniversary Celebration tasting event . 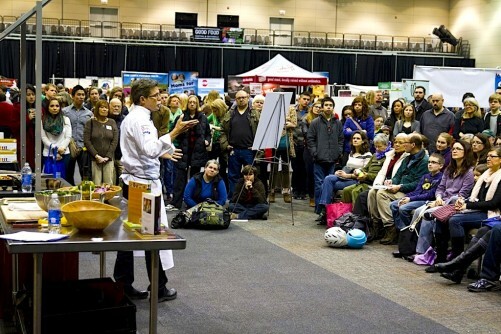 Here Rick chats with Nora Pouillon of Washington, D.C.’s certified organic Restaurant Nora, and Deann chats with Peter and Stephanie Klein of Michigan’s Seedling Fruit. 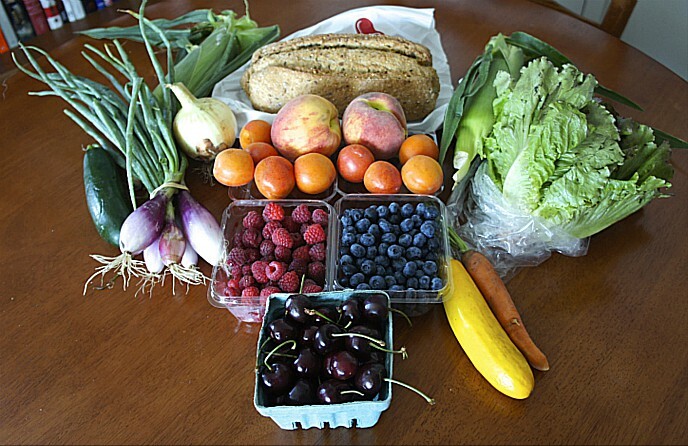 All photos by Bob Benenson/FamilyFarmed. This entry was posted in Awards, Baking, Butchering, Chef activism, Chef advocacy, Family Farms, Farm to school movement, Farm to table dining, Farm to Table: Keeping It Real, Food activism, Food education, Food waste, Frontera 30th Anniversary Celebration, Frontera Farmer Foundation, Good Food Dining, Good Food Photos, Good Food restaurant trends, James Beard Foundation Awards, Local Food, Restaurants and Good Food, Sustainable dining and tagged Abe Conlon, Abra Berens, Adrienne Lo, Anselmo Ramirez, Billy Sunday A10, Bittersweet Pastry Shop and Cafe, Blue Dragon, Blue Ginger, Brent Balika, Chef Paul Kahan, Chef Rick Bayless, Cosmo Goss, Deann Bayless, Duck Duck Goat, Erling Wu-Bower, Fat Rice, Frontera 30th Anniversary Celebration, Frontera Farmer Foundation, Frontera Grill, Frontera restaurant group, Girl & The Goat, HotChocolate Bakery, Ixcateco Grill, James Beard Foundation Awards, Jason Hammel, Johnny Anderes, Josefina Santacruz, Little Goat Diner, Local Foods Chicago, Lula Cafe, Marisol at the Museum of Contemporary Art, Matthias Merges, Mindy Gohr, Mindy Segal, Mindy's Edibles, Mindy's HotChocolate, Ming Tsai, Nico Osteria, Nora Pouillon, Old Irving Brewing Company, One Off Hospitality, Pilot Light Chefs, Restaurant Nora, Restaurante Sesame, Rob Levitt, Simply Ming, Stephanie Izard, Stock Cafe at Local Foods, The Butcher & Larder, The Kitchen Chicago, The Kitchen Community, The Mina Group, The Publican, Yusho. Bookmark the permalink.